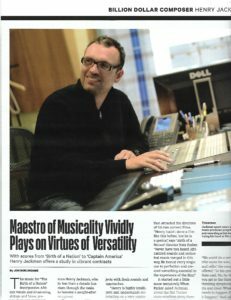 The latest in Variety‘s series of Billion Dollar Composers (so-called because the aggregate box-office of all their movies exceeds $1 billion) is Englishman Henry Jackman, whose music you may know from the last two Captain America movies — but who may be an awards contender for his music for the upcoming The Birth of a Nation. Jackman is a unique blend of highly trained classical composer and former pop/rock producer, and his thoughts on film music in the 21st century are fascinating. 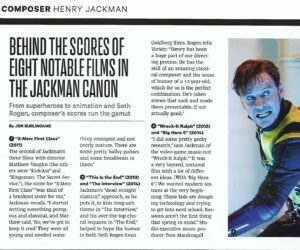 During preparation of the main story and this sidebar on eight of his most interesting scores, I also interviewed Captain America directors Anthony and Joe Russo, Birth of a Nation director Nate Parker, Jack Reacher director Ed Zwick and The Interview co-director Seth Rogen (who, predictably, offered the funniest line in either story). This entry was posted in Composers, Film Music, Interviews and tagged Anthony Russo, Billion Dollar Composer, Captain America: Civil War, Captain America: The Winter Soldier, Ed Zwick, Henry Jackman, Joe Russo, Nate Parker, Seth Rogen, The Birth of a Nation, Variety on September 29, 2016 by Jon Burlingame.